Towards the end of 2014, whilst involved in helping to prepare for a small True Life in God retreat in Egypt, Vassula asked me if I were free to accompany her to Bangladesh, as she had been nominated for a fourth time to receive the Peace Gold Award. 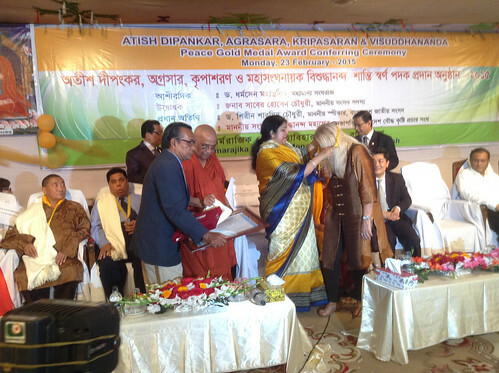 The award ceremony was launched in memory of Buddhist Scholar Atish Dipankar, Mahasanhanayaka Vissuddhananda Mahathero, Sanghanayaka Agrasara Mahathero and Kripasaran Mahathero by Bangladesh Bouddha Kristi Prachar Sangha. 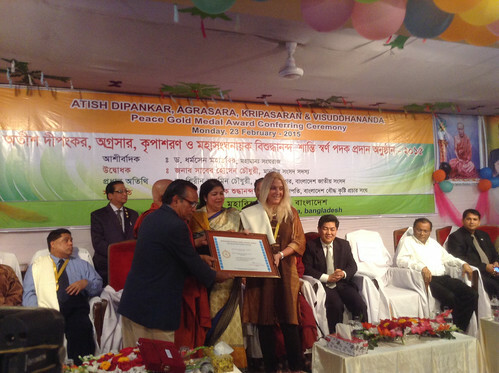 I was overjoyed and excited on two accounts: namely because of the thought that I would be returning to Bangladesh where I had lived for almost five years, where I actually first met Vassula in person and more importantly, because of the fact that Vassula had been nominated for a fourth time in recognition of her great contribution and efforts towards establishing inter-religious harmony and promoting world peace among all peoples and faiths. 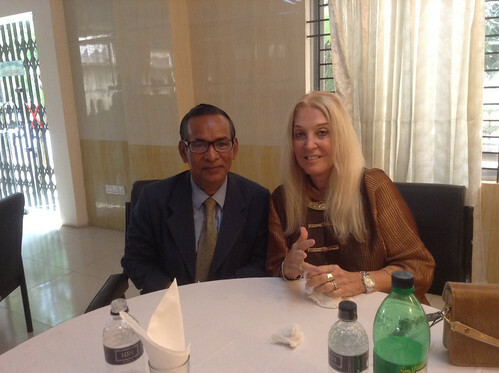 Thankfully, I was able to accept the invitation to accompany her and this short report is an attempt at sharing my experience of this occasion and mission visit to Bangladesh, the country in which True Life in God began, almost 30 years ago. Bangladesh is the world’s eighth most populous country with a population of over 160 million people, as well as being one of the most densely populated countries in the world. It is has the world’s largest delta and is known as the “land of rivers”. This seems so appropriate when we consider that the work of the Holy Spirit began this love Hymn here in Bangladesh. We are reminded of the message of June 19th 1995, “Seek Me, your Lord: I am Love….ask for My Spirit of Counsel to make you desire integrity, humility, loyalty and goodness so that your step will not fail you to do wrong. Unfailingly My Spirit of Counsel will make His Law known to you and counsel you saying: “do not equal anyone to God; serve the cause of right, lift the oppressed; do no harm to anyone, but love and help one another….be alert to those counsels and you shall fragrance, and your happiness will be like a river breaking into several rivulets, announcing and counselling others to seek the Kingdom of Heaven and the glory of Our Trinitarian Holiness, which can adorn your spirit in our Splendour forever and ever”. As I was aware that Vassula would have only finished a mission visit to France the day prior to our departure for Bangladesh, I travelled to Athens to meet up with her, so as to accompany her on the 6000 mile trip across Asia to the land of the Bengal, (the literal meaning of Bangladesh). After spending the night in Athens, we began our journey to Bangladesh the following morning, after having been provided breakfast and warm camaraderie from several of the Athenian stalwarts and collaborators of True Life in God: Gethsemane, Teresa, Theodora and Eni. They took us to the Athens airport; we bade our farewells and proceeded to prepare for the four and a half hour flight to Doha in Quatar on the Persian Gulf, from where we would catch a connecting flight to Dhaka. We arrived in Doha on time and after a two and half hour wait for our connection, we boarded late evening, yet again en route for Dhaka. I was chatting with Vassula whilst we were in transit and asked her how she comes to a decision as to who should travel with her when she goes on missions. She replied that she just seems to get a feeling about who she should ask and doesn’t really know the reason why. However, it often manifests itself afterwards and she gave me the example of someone who had accompanied her on one of her trips to Mexico. I remember thinking to myself , What on earth can I do that would be different from anyone else being asked to accompany?, and then thought to myself, “all I can do is look after people”, as my background is in nursing and midwifery. At that, I thought no more of it. Whilst handing our boarding cards over to the attendant in preparation for boarding, it was wonderful to hear the chatter of Bengali amongst several excited workers who appeared to be returning home for a spell from their work based in Doha, a place from where many Bengalis seek employment, far away from their homeland. The flight lasted over five hours and as we approached Dhaka, we were surprised to hear the engines of the plane change sound. We suddenly started to ascend again and both Vassula and I wondered what was going on. The pilot announced shortly afterwards, that they had misjudged the approach to the airport and had to make a second attempt at landing. Ten minutes later, we approached Dhaka again and this time successfully landed, heralded by thousands of breakfast hungry mosquitoes in the corridors of the airport and at the reception doors of the main terminal. Upon exiting, we were able to witness the sun rising, as if to greet us and say “Welcome”. While feeling the heat and humidity upon our faces, hearing and seeing the great throng of hundreds of people waiting and looking for their friends and relatives arriving, as the dust and the various smells of an airport were wakening up to another morning, made us all too aware that we were 4 hours ahead of Athens time and in a world very different from the one left behind in Europe. We were quickly ushered out of the airport and onto the busy highway that runs from the airport to the area of Banani, through which we took a route to Gulshan, passing by the house that Vassula lived in when she resided with her family in Bangladesh and from where the messages and her charism really began. We knew that we would be visiting the area of Banani in the next few days. In knowing that and because Vassula and I were tired after the journey, the driver, directed by our friends was keen to make haste and arrive at the area of Gulshan where we were accommodated in a guest house. From here, we managed to get a few hours rest after the long journey, before Mohammed Islam and Sujit arrived to take us out to lunch. The hospitality of the Bengali people is overwhelming; no sooner had we experienced this hospitality at lunchtime, as we were back out in the evening, invited for supper by a colleague and friend who is the Member Secretary for the Global Unity for Peace, Mr Jahangir Hossain. The evening was spent discussing some of the work that Jahangir is involved in, as well as general issues in relation to Bangladesh. It was a welcome opportunity to be able to set the situation of Bengladesh in context. Bangladesh was experiencing yet another period of long strikes which are known colloquially as hartals; it makes the planning and moving about difficult, as local transport and infrastructure is impacted in a challenging way, when there is work to be done regarding a mission visit. Nevertheless, we were all fairly confident that the hartals would not affect the program for the next four days as planning had been meticulously thought out by Sujit. Following a fairly restful sleep, we awoke in the morning and after having had breakfast were delighted to receive a phone call to inform us that Fr Stephen Rafael from Calcutta had travelled from India (as Calcutta, in the Bengal region of India is only 150 miles away and a thirty minute flight away from Dhaka) to join Vassula at this 4th Gold award ceremony. Fr Stephen looked tired and was experiencing a bit of difficulty with his chronic asthma from which he suffers. However, in his usual good and positive manner shared his enthusiasm as to what the day ahead would bring, disregarding any health issue that may be looming. Having decided to change accommodation to an area in Gulshan that was more familiar to us both, we discussed this with Father Stephen; instead of him settling into the accommodation in which we had just spent the night, we all moved to a nearby hotel in which we had previously stayed. We were fortunate, since this hotel did not seem as keen on breeding the hordes of mosquitoes as the one in which we had just spent the night. After quickly settling into this accommodation, we were ushered by Sujit and Imam Mohammed Islam into a waiting car, headed for Dhammarajika Buddhist Monastery complex to attend the 150th birthday of the most venerable Kripasharan Matathero. Although this venue is not that far away from where we were staying, Dhaka is such a vast city with over 14 and a half million people in just 125 square miles, that one has to consider timing when planning any journey that needs to be undertaken, as traffic can be so congested that it easily and literally brings any mode of transport to an immediate halt; if this factor is forgotten, it can disrupt any sort of occasion. On arrival at Dhammerajika, Vassula stepped out of the car to be greeted , not only with the midday heat of Dhaka brushing her face through the rays from the sun, but with a great throng of noise from the drumbeats and trumpets of the Ramesshor band party to announce her arrival. The dust, the noise from the drums and trumpets and the excitement from the people gathered mixed with the smell of bouquets and garlands of roses and tuberose that lined the walkway of the great marquee entrance to the Monastery complex was like a scene out of a movie. There were other friends who had joined us and who happened to have very good camera equipment with them, so they were able to take good photographs and shots of the whole occasion. They seemed to be mesmerised by the reception that Vassula received, as she walked down the entrance of the Dhammarajika Buddhist Monastery complex where the most venerable Sanghanayaka Suddhananda Mahathero awaited her arrival and ushered her into a small room where he receives important guests. Following this short time period of greeting with Vassula, we were ushered out and onto a large platform looking out onto a vast audience of people who had come to join the celebration. 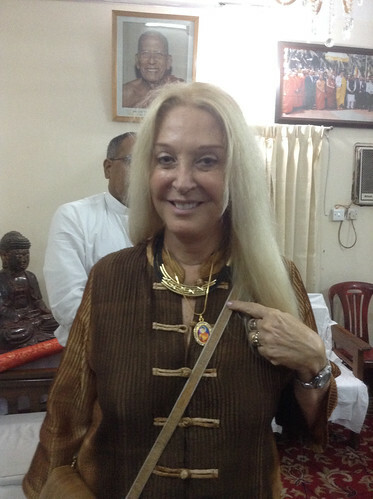 Although I felt uncomfortable at being up on the platform alongside Vassula, as I was merely accompanying her, I was imprinted all the more on the great admiration that the Buddhists here in Bangladesh give Vassula, as well as the honour they give her as a guest who brings a message of global peace. It also provided me with a brilliant view of the whole scene before our eyes. There were several speeches made by the National Buddhist Youth congregation in the morning; and although Vassula does not speak any Bengala (Bangla), she sat for several hours throughout these talks, as if she understood each word, never flinching in the increasing heat and noise that the day produced. We were invited to join everyone for a lunch that the most Venerable Suddhananda Mahathero oversaw himself in the large complex dining room. The guests were made to feel like royalty, whilst he ate nothing and served us until we were all satiated. There were vast vats of rice and several different types of curry that young men who had been homed in the Monastery complex had prepared for everyone. 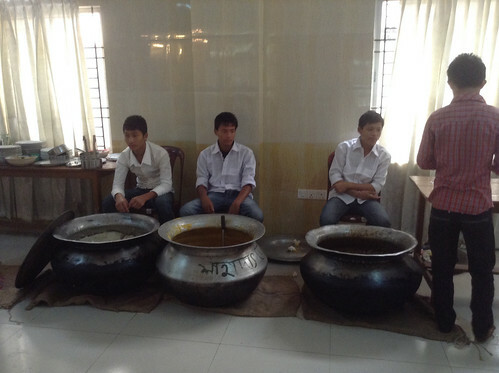 Young men preparing to serve lunch at Dhammarajika Monastery complex and below Vassula and Sujit Barau at Dhammarajika Dhaka, following lunch on the day of the 150th anniversary of the birthday of the most venerable Kripasharan Mahathero, February 22nd 2015. After lunch we met with some of the other 12 distinguished guests who had been invited to receive the Atisha peace gold award for their outstanding contribution in different fields. 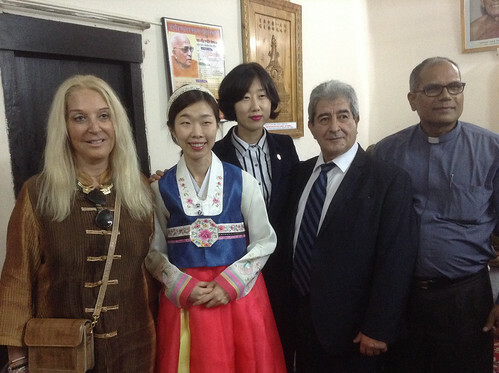 Vassula met Jenny Lee from the republic of Korea, who represented the Heavenly culture, World Peace, Restoration of light. She wished to speak and to have her picture taken with Vassula, (below) since her friend was also going to receive an award. Vassula here is speaking with a Tibetan Monk through a translator who was very interested to hear about Vassula’s charism and about the messages. We were again ushered into the large marquee area for the life and works seminar of Kripasaran Mahathero. 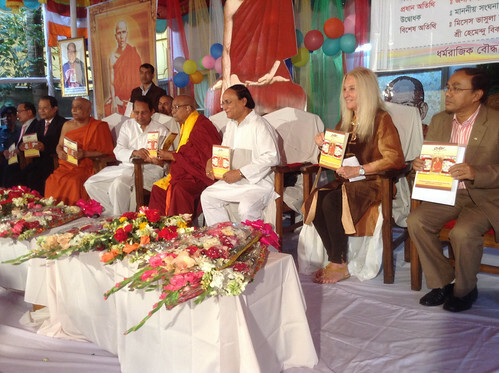 Following a recitation from Holy Tripitaka and an inaugural speech by most venerable Sanghanayaka Suddhananda Mahathero, Vassula delivered her speech as a “distinguished guest “. This was the main speech of the whole mission visit and I stood back on the ground below the platform from where Vassula delivered the speech, so that I could feel the temperature of the crowd, not in the literal sense of the word, but to determine how I felt they received what was being said. I watched faces concentrating on every word, consuming their meaning, as if it were being offered as a gift for those who wished to take; and take it, they seemed to do. 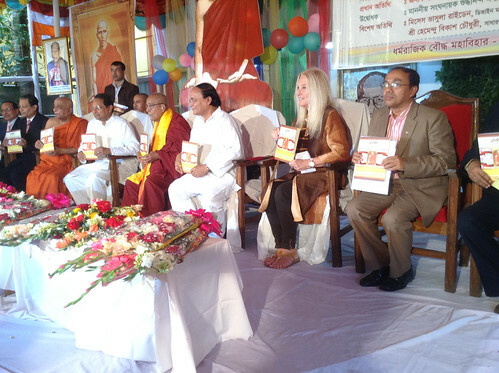 It is my great pleasure and privilege as the representative of the followers of “True Life in God,” to connect with you in honor of the 150th Birth Anniversary of Most Reverend Kripasaran Mahathero, Founder of Bengal Buddhist Association and Dharmankur Buddhist Temple in Kolkata, West Bengal, India. Through the fruits of his hard work and sacrifices, Venerable Kripasaran, resulted a revival of Buddhism to rediscover its legacy. Venerable Krispasaran should be an example to all that without sacrifice and hard work nothing can change. Today, we are gathered here in a place where we notice the continuation of sacrifice, of hard work that is being done, sacrificing one’s life to serve the orphan, to have compassion for the widow, and lift the oppressed, to console the weak, the sick and lonely, to encourage the persecuted. These acts of charity are signs of dignity and true love that are done without self-interest. Such people are born not to live for themselves, but to be of service to others and give their life for others. They are an example of compassion, while charity is an act of high nobility and ever so honorable. On earth, each one of us has a mission, which we must complete successfully. But it cannot be successful unless we do it sincerely with hard work and a lot of self-sacrifice. My part and duty in this world, after I’ve been called by God, is to promote peace, reconciliation and unity. It is not easy with what we are facing in our times, but I depend on God’s help. Our Creator has impressed upon all His creation in his conscious what is right and what is wrong. Now, everyone must have noticed that the world is in a pretty bad shape. Corruption, violence and sufferings have augmented. The origin of any sort of conflict is usually located in our heart and sometimes well rooted. Our heart is like a mirror of our soul. It reflects on us what we have within it. If we have no place for the Divine in our heart but instead carry hatred and war, this heart’s feelings will be exteriorized and they will become reality, for a man’s actions flow out of what fills his heart. At night, I look at the stars and the planets; I look at the vast Universe. Then I see our world, which is as a small speck of dust floating among zillions of stars and planets among this beauty of our galaxy. And I ask myself, how is it that this speck of dust that is our planet, managed to have so much barbaric violence and hatred coming out of its inhabitants? What inspires its inhabitants to be so wicked? What went wrong with humanity? Why is it obeying more and more the law of Evil rather than the Law of God, which is Love and Mercy? Where has humanity’s dignity gone? Perhaps some of us have failed to speak up about dictatorial leadership, unethical behavior towards others, and have been disrespectful of the beliefs and traditions of the others, either because of fear, or indifference, or of pride. Therefore, I suggest we teach our people to promote understanding and respect for each other’s religious traditions and refrain from denigrating them. With this we will gain the trophy, which is: peace and harmony and unity. The entire Universe functions in Harmony and Order under the Eyes of God, so how is it that there are so many on this planet who have failed to recognize the Order and the Harmony of God? We were not created to cover the earth with tyranny and blood. We were not created to be murderers; but it is obvious that all these carnages are because man has forgotten his Creator and his failure to give glory to God. On earth, we all live under the same sun and are but one big family under God’s Light. No matter what part of the world we may come from, we are all equal before God’s eyes. Those who are in different religions are not less creatures made in the Image of God and destined ultimately to live in the House of God. And as human beings, we have basically the same needs; we all look for happiness, we all want good health. Who of us does not enjoy peace? Who of us does not enjoy good health? No one. It is therefore, our responsibility for one another to cultivate a worldwide awareness of justice to stop this evil and this division among people; We have the capacity if we try harder to work diligently together in bridging our divisions instead of augmenting them; we should become breach menders, mending our differences and promoting peace where there is war, unity where there is division. In remaining silent while watching all these injustices and doing nothing about it, for fear of losing one’s reputation, or one’s identity, or comfort, or one’s life, this is considered far from human dignity; it is hypocritical; and nothing goes unseen in God’s Eyes. We need a solution. The first thing one should focus on is education, which will resolve conflicts starting with a thirst for the truth. Educating the family, and extending it to our institutions, to our religious communities, to the whole world, telling them that man can live in peace and harmony, and can be reconciled with one another so long as they learn to love; reminding them of their Divine origin and moral values; rather than inspiring them with revenge. We must remind them to become the Image of the Living God, or of our Saints, who have no trace of impurity, no trace of revenge, no trace of hatred. The world has been over-focusing on technology and materialism and have somewhat neglected the humanitarian part and its realities. Humans are not robots. The event was closed by a vote of thanks by Mr Anupam Barua, Headmaster of Dharmarajika High School. From there we were provided dinner at the monastery complex, after which, we made our way back to our hotel. Father Stephen kindly celebrated Mass; all three of us agreed that the day had been eventful and had drawn to a natural close. It was almost midnight. On that Sunday morning, after breakfast, we noticed that Father Stephen was not too well. He was having difficulty breathing and had chest pain as well as shortness of breath. I too had become unwell with severe back pain, nothing that had bothered me in the past, and could hardly move. It was very strange; we believed it was like some sort of “attack”, almost a distraction for Vassula, so as to interfere with the mission for which she had been sent to Bangladesh. Both of us, however, accompanied Vassula as planned. 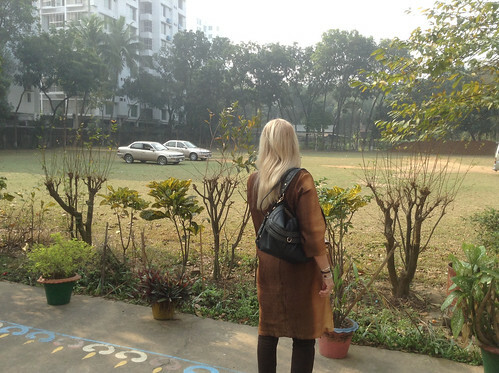 We had some time free in the morning for our trip with Vassula to Banani, the area that she lived in, in Dhaka when her charism began in 1985. We went to the seminary where Vassula had gone, in order to speak to a member of the clergy, so as to ask what was happening to herself at that time. We also visited the house in which she lived and from where she used to write the messages, at the very beginning of her reception. I took the photo below, as I watched Vassula stand and ponder from the doors of the church as to just how much life seemed to have changed from those days. We returned to the hotel from Banani just before midday; we were to be picked up as we had been the previous day, to go to Dharmarajika Monastery complex. This day was the actual day that Vassula was to receive the award. When we arrived, we were ushered to take seats in the larger hall complex within the monastery grounds. There must have been about 700 people in the hall, if not more. There was a large stage set, ready to receive the guests as they were called to receive their awards. The event began again by a recitation from the Holy Tripitaka, the name given to the Buddhist Holy Scriptures. At the beginning of the event, there was the customary offer of garlands for the guests, who were comprised of Ambassadors and High Commissioners of China, Bhutan, India, and Myanmar. Additionally, the event began with a dance drama that provided each guest with a wonderful example of the passionate zest for art that the Bengalis seem to have, along with an example of the broad spectrum of artistic activity that they are engaged in. This stream of artistic expression seems to stem from a cultural growth that came about due to Bengal being the seat of Buddhism and Mauryan learning. The guests were treated to a most spectacular performance. The award ceremony then began and Vassula was called up fourth in line to receive the gold award. The honorable speaker of the Bangladesh National Assembly, Dr Shirin Sharmin Chaudhury presented Vassula with the award, and in turn, Vassula made a short speech of thanks, paraphrasing some of what her speech had contained the previous day. The noise in the hall was immense and the excitement tangible as people seemed proud of the occasion. The day was drawing to a close. One of the guests who had received an award stood up and sang a wonderful song in Bangla, regaling with everyone as to how proud he is of his country. He was jovial, dressed in a red tunic and with white beard; it was as if the fictitious Santa Claus was closing the ceremony. Everyone was ready to leave with the gift of knowing that peace is sought worldwide. For me, the words of scripture came to mind that, “I truly understand that God shows no partiality”, Acts 10:34. The following day, Monday the 24th of February was supposed to be a day in which Vassula could go back again to visit some other places in Banani and rest before having to go to the airport just before midnight to begin the long journey back to Athens. However, just after breakfast, Fr Stephen took ill again and collapsed, having to be admitted to a local hospital. I was able to speak to the nurses who were looking after him, as I had worked in Bangladesh for almost 5 years and knew enough of the language to do this. My job, at that time, was in working at the post graduate school of nursing. The doctor in attendance only wanted to do a chest x-ray; however, I pushed for a whole load of other tests and examinations to be done, as I deemed it necessary due to his persistent ill health. With this added set of examinations, we found out what the matter was and Father was able to get treated in the proper way that was necessary for his condition. I stayed with him in the hospital up until 45 minutes before we had to leave for the airport to fly back. It wasn’t until Vassula and I were at the point of leaving the hotel, that Vassula said, “thank goodness you were here”. I suddenly realized that she had been inspired yet again, and I had the answer to my question…why did she ask me to go to Bangladesh?! We departed from Dhaka at about 2 a.m and arrived back in Athens the following day after two flights, again via Doha. It had been a short mission trip in comparison to the trips that Vassula does regularly, but it had certainly been action packed.